Kasenga is a rural settlement of 16,000 people located 51 kilometers east of Lusaka, the capital of Zambia. The area includes eight traditional villages where several NGOs actively support agricultural projects for small holder farmers. Despite having good roads and infrastructure, there are no reliable means of transportation for pregnant women and they often have to give birth either at home, or even on their way to the nearest health centre, 15 kilometres away. Taxis are not an option: they cost $40 and women can’t afford them. Women have died on their way to the clinics or giving birth at home. To worsen the situation, women do not have access to pre- or post-natal care nor medical attention for STDs or HIV and AIDS. Mother-to-child transmission of these diseases is high, and the prevalence of malaria and diseases related to diarrhoea have led to many deaths. In 2007, the Anglican Diocese of Lusaka took on the project of improving accessibility to health care by building a health centre in Kasenga. They have built delivery and waiting rooms, one maternity ward, pre- and post-natal consultation rooms, one patient screening and consultation room, a dispensary, two staff houses, a shelter and a large generator to provide electricity to the whole facility, and a borehole well to provide safe drinkable water for the community. There’s just one problem. 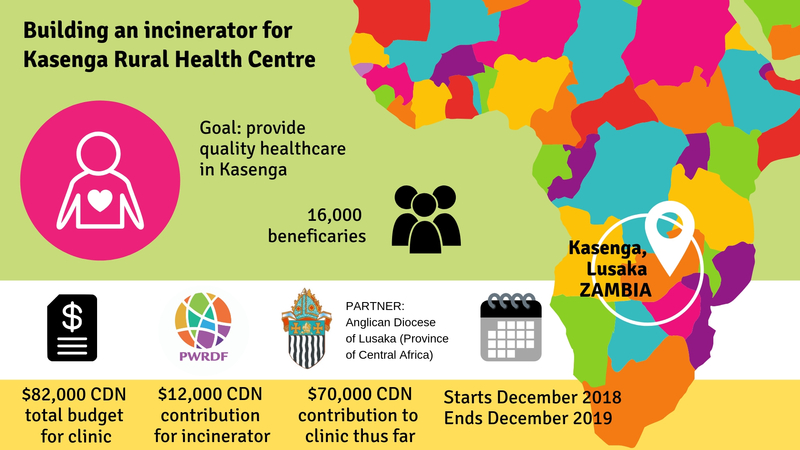 Until an incinerator for waste management is built, the centre cannot offer health services, in accordance with the Zambian Ministry of Health’s regulations. PWRDF is pleased to support the Diocese of Lusaka with $12,000 to build an incinerator. A donation of $7,665 came from St. John the Baptist Church, Cobble Hill, B.C., in the Diocese of British Columbia for the project as well. The Diocese of Lusaka is a faith-based organization that currently runs two health facilities in the Province of Southern and in Lusaka. Its mandate is to provide spiritual, social and health care to the population in their areas, regardless of the religious affiliation of the population. Juan Camilo Suárez Colmenares is a Communications Intern at PWRDF.